and I are happy to share with you the quilts we made from the 20 blocks. We didn't really specify fabric styles or colors, so this was true challenge. Everyone mailed their blocks to Lee and she spent time mixing and matching them into 3 piles of coordinating blocks. I received blocks that were centered around primary colors - Reds, blues, yellows, etc. I had seven blocks and played around with them on the floor of my sewing room until I had a layout I liked. The back is a great print from Carrie Bloomston's Collage fabric line. I didn't have quite enough so I added a coordinating turquoise to the edges. The binding is a Lizzy House Pearl Bracelet print. For the quilting, I did closely spaced wavy lines, at an angle. 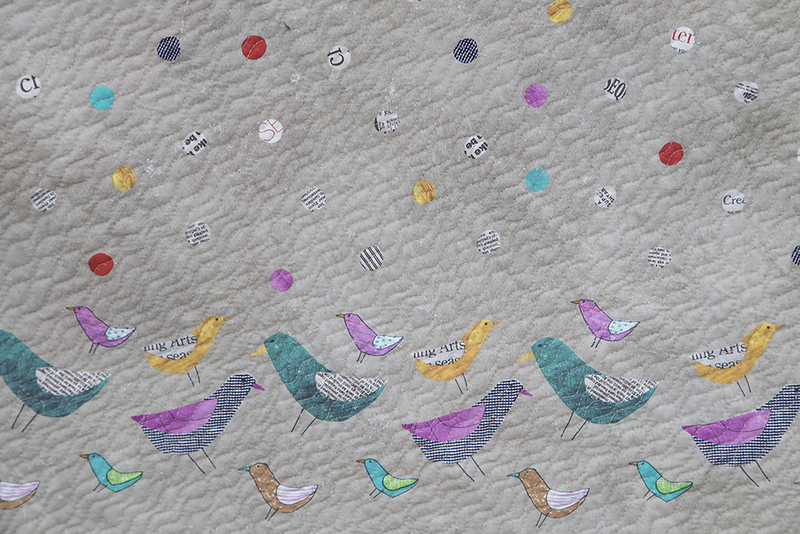 I talk a lot about wavy quilting on this blog, but just as a refresher - I use the running stitch on my machine (Bernina stitch #4), max out the width and set the length to 4.0. I use my walking foot while quilting. I used the edge of the blocks as my starting point for the first line, and after that just used the 1/4" marking of my walking foot as a loose spacing guide. As we said at the beginning of the week, these samplers are going to be donated to various charities. I haven't decided where to send this one just yet. I was certain you all would have some ideas for me! It is baby/toddler sized. Feel free to leave your ideas (and websites if you have them) in the comments!